HOUSTON (KTRK) -- It's the second weekend of major closures along the Hardy Toll Road. If you are driving to Bush Intercontinental Airport this weekend, you may need to detour. Hardy Toll Road will be closed in both directions from FM 1960 to IH 45 North, Friday at 10PM through Monday at 5AM. Additionally, the FM 1960 interchange at the Hardy Toll Road will be closed during the same time period. All northbound traffic on the Hardy Toll Road will be required to exit the main lanes at FM 1960. Drivers going southbound Hardy Toll Road will be able to do so after FM 1960. The southbound IH 45 direct connector ramp to southbound Hardy Toll Road will also be closed. The Hardy Airport Connector will also be closed in both directions all the way to JFK boulevard. Additionally, the westbound Hardy Airport Connector exit ramp to Hardy Toll Road northbound will be closed. All lanes of the Sam Houston Tollway will be closed both ways from US 290 to Clay Rd. on Sunday, Feb. 7 from 5AM to 10AM. Northbound traffic on the Sam Houston Tollway will be forced exit the main lanes at Tanner Road. Southbound traffic on the Sam Houston Tollway will need to exit the main lanes at US 290. 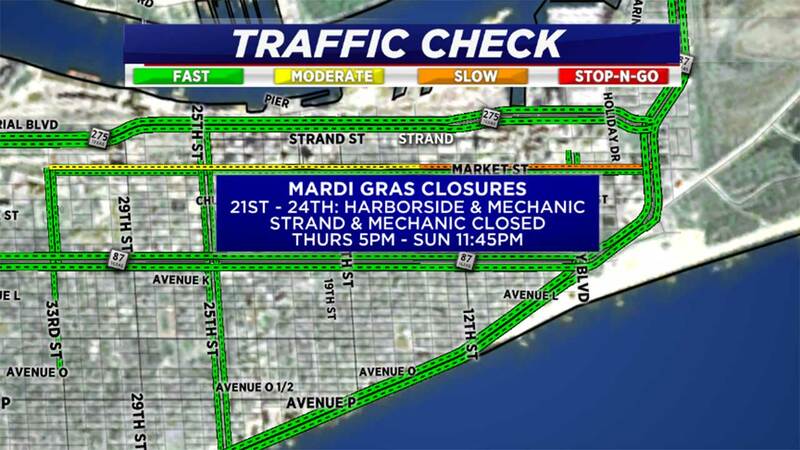 It's also the second weekend of Mardi Gras, and there are several lane closures on Galveston Island for all of the festivities. Starting Thursday at 5PM, 21st through 24th streets from Harborside to Strand and Strand to Mechanic will be blocked off. As an alternate route, take 5th street to get around the closure. Friday at 2PM, streets will be blocked from Harborside to Mechanic, and 20th-25th streets, and 25th from Market to Harborside. Seawall between 25th Street to 33rd will be shut down on Saturday from 10AM - 2PM, and from 19th to 27th Streets 2PM-10PM. All traffic will be detoured westbound away from the parade routes. Streets will open by 11:45PM on Sunday evening.